Uncertainty is not a reason to wait, but MORE reason to act! Nobody has any doubt that climate forecasts are uncertain. They are uncertain with or without anthropogenic (human caused) effects of greenhouse gas emissions. Then, when trying to gauge the effects of humans, we have to take the difference between the uncertain climate forecast with extra emissions and the uncertain forecast without extra emissions. That only compounds the uncertainty! Suppose for example that without our extra carbon dioxide and other greenhouse gas emissions, the temperature in 2050 is predicted to average 50°F plus or minus 5°. And suppose the temperature with our current rate of emissions is predicted to average 52°F plus or minus 5°F. Then the difference (the effect of emissions) is not just 52-50 = 2°F. Rather, it could be anywhere between 57-45 = 12°F, at the high end, or 47-55 = -8°F, at the low end. We just don’t know. That simplified example is overstated. 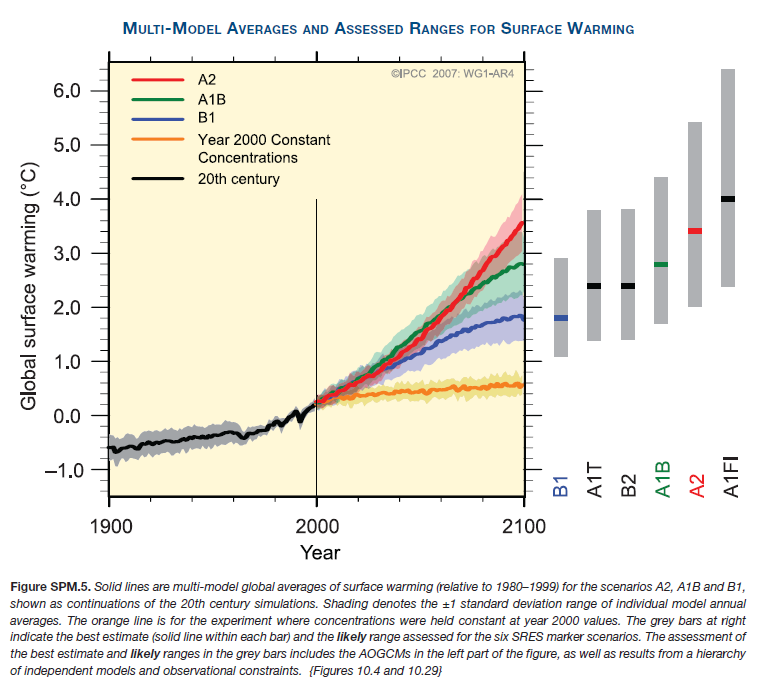 But look at the figure from the IPCC Fourth Assessment Report’s “Summary for Policymakers”. It shows a set of model simulations with a range of results anywhere from no global warming to about 4°C (which is about 7°F). That is a lot of uncertainty, but that figure does not reflect all possible uncertainties. Those include (but are not limited to): uncertainties about the amount of GHG emissions in the future, about the effect of those GHG emissions on ambient atmospheric concentrations, about the effect of ambient atmospheric concentrations on air temperature, about the effects of air temperature on ocean water temperature at different depths, about the feedback effects of ocean water temperature back on air temperature, the effects of all those changes on polar ice caps, the effects of polar ice caps on sea level rise, the effects of sea level rise on millions of miles of coastline around the world, and the effect of all those changes on economic damages. Many have taken this inherent uncertainty as a reason not to act now, but instead to wait, to undertake more research, and to try to reduce that uncertainty. That may be a natural initial reaction, but it is not a good one. It assumes that uncertainty reduces the need to act, when in fact increases in uncertainty only increase the need to act! That is not to say research is unwarranted, or that we have nothing more to learn. We can and should try to find out more and try to reduce uncertainties. But a lot of that research may raise additional considerations and uncertainties! Uncertainty is inherent to the problem and will never disappear, so waiting for resolution of the uncertainty means waiting forever and doing nothing forever. Uncertainty itself is a problem we need to face, as it raises additional costs we can reduce. A single hot summer or drought is a problem with which we have learned to cope. But now we don’t even know whether we are facing that same level of heat and drought, or perhaps much more heat, reduced rainfall, extreme storms, huge loss of landmass, etc., etc., etc. It is the unknown possibility of such loss that ought to make us act now to protect ourselves. To the extent that anthropogenic GHG emissions raise uncertainties about future climate, the more we need policies that are resilient to those uncertainties: policies that increase our abilities to deal with drought, to make it possible to increase crop production with less rainfall, and to protect ourselves against the possibility of storms worse than Katrina. Which brings us to the key distinction between adaptation and mitigation. One way to protect ourselves is to adapt to droughts and storms, as just mentioned. But another way to protect ourselves against those adverse possibilities is to start now to mitigate climate change by reducing GHG emissions.